Learn the Benefits of Making Your Events Tobacco-Free! Tobacco Free Events provide endless benefits to community members by allowing them to enjoy an event with the worry of being exposed to secondhand smoke or vapor, providing an environment that shows youth, tobacco use is not the norm, and by supporting those that have made the difficult decision to quit the use of tobacco. Tobacco is the number preventable cause of death and disease and Tobacco Free Events send a very important message that the community’s health and well-being are a priority. Together, we can reduce the toll of tobacco on our community through Tobacco Free Events. The Tobacco Free Partnership is currently working towards another big goal, which is to lead the Highlands County Fairgrounds in this same direction. The annual Highlands County Fair brings more than 10,000 people to the fairgrounds each year. Of that, many of the those are youth, whom are fiercely targeted by Big Tobacco to create lifelong tobacco users. Between flavored tobacco products and the popularity of juuling, our youth are at a substantially high risk of experimenting and picking up a lasting habit. This is why creating environments free of toxic exposure and influence is crucial in fighting this battle and why tobacco free events/venues is a priceless effort to help curb the appeal. Why else should we promote Tobacco Free Event policies? It also provides an event that requires less clean-up of litter and debris from smoking and lowers the risk of fire or other damages caused by cigarettes. Tobacco Free Events can also attract a broader audience and increase overall attendance. By choosing to make your event Tobacco Free, you are sending the message that the health and safety of your participants is of utmost importance. 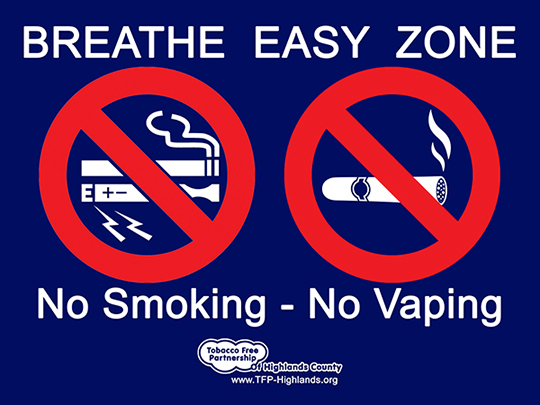 Creating a Tobacco Free policy for your event doesn’t have to be complicated. QuitDoc Foundation, along with the Tobacco Free Partnership of Highlands County and the Community Health Advocate can help with policy initiation, guidance and additional support needed. Feel free to reach out with any questions: ajohn@quitdoc.com.